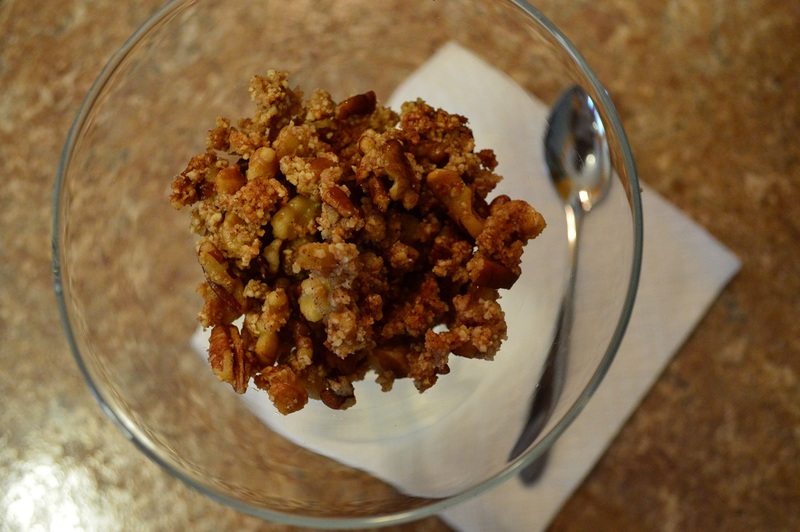 When I found the mother of this recipe, it was on the top of a grain-free apple crisp. Consensus from my taste testers? It was too nutty (hubby). And it wasn’t apple-crispy enough (father-in-law). My mother-in-law and I, however, loved it. I thought it did need to be a tad sweeter tho. Yup, it was a flop. Too greasy, too chewy and too crumbly at the same time. So instead of throwing the cookie sheet (and recipe) out the window, I decided to tweak. (No, I don’t mean twerk. Gag.) And I tweaked and I tweaked. Finally, it was close. Hubby decided to try it. Hubby loved it. 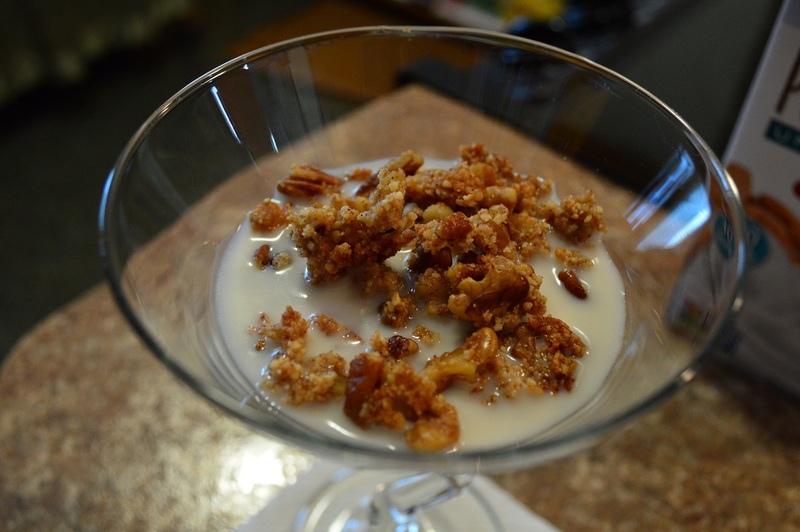 When it disguised itself as granola, suddenly it wasn’t “too nutty” anymore. My husband, my man who normally loathes walnuts and pecans with all his heart, was eating ALL OF MY GRANOLA. Make that ATE all of my granola. Triumph from a successful recipe quickly became a ‘Humph’. (see also: arms crossed, cross look on face). So I decided I would share it with you! 🙂 Hope you enjoy! 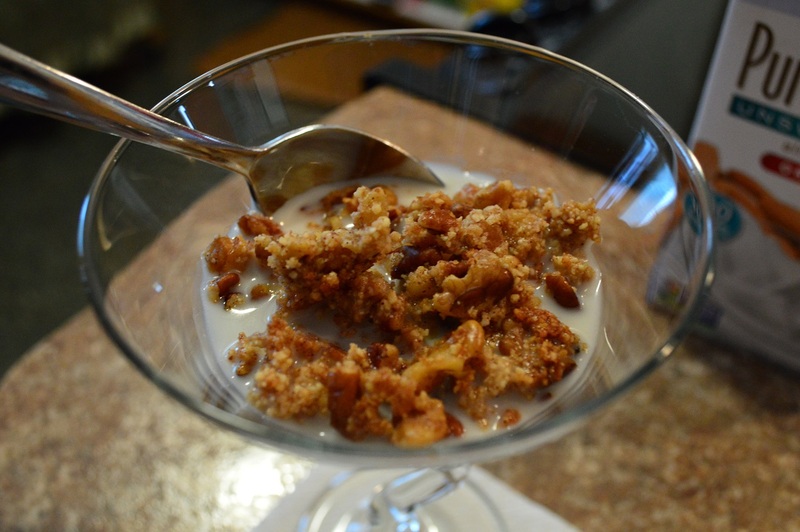 A crunchy, sweet granola that works great as a topping for healthy, homemade ice cream, as a cereal for breakfast with unsweetened almond milk or raw milk, or just snacking by the handful! Add all nuts to mixing bowl. Sprinkle cinnamon on top and mix in. Add coconut oil (soft or liquid) and 1/4 c. maple syrup. 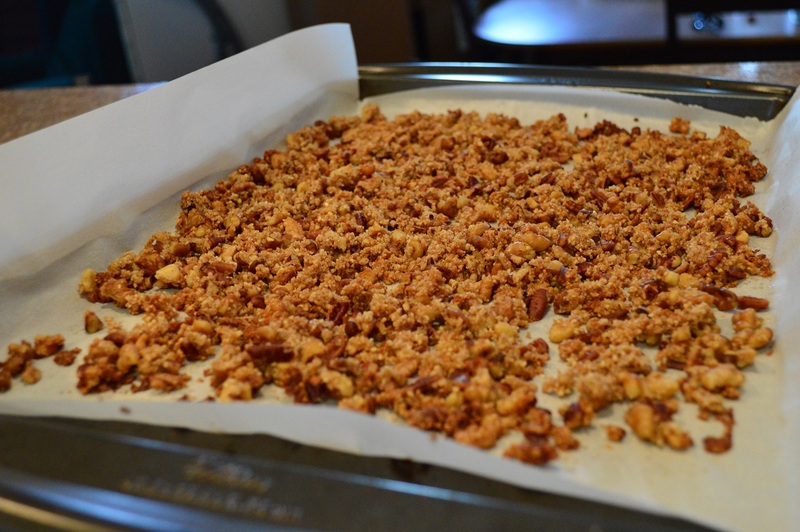 Drop onto parchment paper and spread out. Drizzle lightly with more maple syrup. Bake for 10-15 minutes (depending on your oven), mixing it several times to avoid the sides browning faster than the middle. I haven't tried this yet, but I imagine you could experiment with the spices to your taste. I think pumpkin pie spice would work well too! Let me know if any of you try something different!